Tyron embarks on a desperate quest to seek the help of Cuhthic, a sorcerer who rules the shadowy, distant land of Lamnagha. 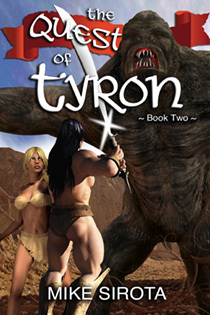 Accompanied by his loyal friend Dehril and the stunning Lanira, Tyron must battle unspeakable horrors across his deadly world. And the price for Cuhthic’s aid? The severed heads of the Three, the dreaded dark magicians of Vorhashekkh.